I'm a part of two quilting bees right now and the past two months have brought me lots of happy mail as I collect the blocks that come in each day. 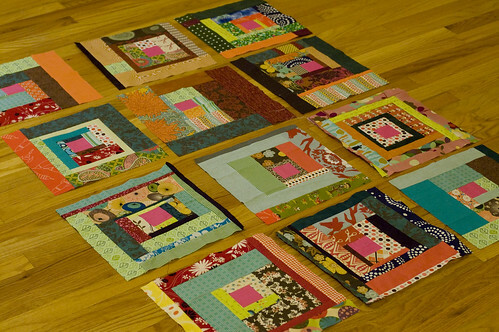 My month for Common Threads was in November and I'm planning on sashing these blocks with a gray solid. My request for the month was no nested blocks or log cabins, just squares and rectangles. And, my month for Bee Beautiful was January (can't believe February is already tomorrow!). 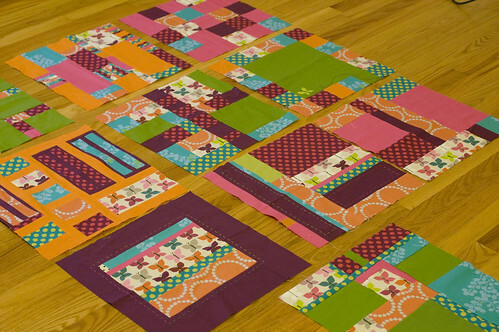 My theme for these blocks was scrappy log cabins with pink centers. 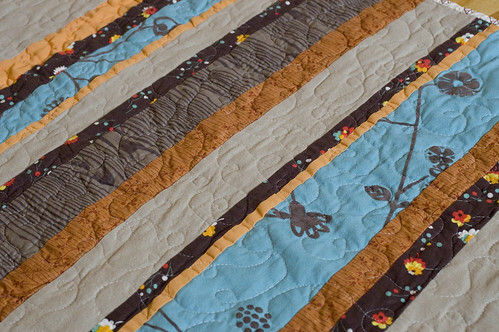 It's been fun to see scraps from memorable projects turned into little mini log cabin blocks! In other news, I have finally gotten around to finishing up my nine patch a day quilt that I started last May. It feels good to almost check something off of my to do list. 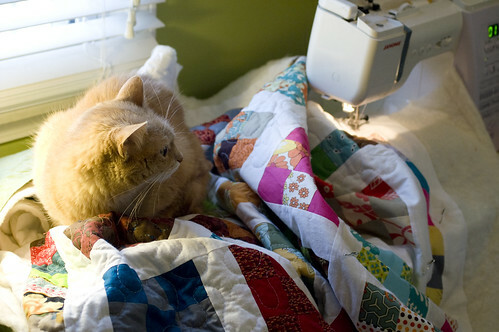 My kitties like quilts, especially new ones, so Nuku Nuku plopped on and got very comfortable this afternoon. I hope to finish getting the binding sewed to the back in the next couple of days and this one will be complete! 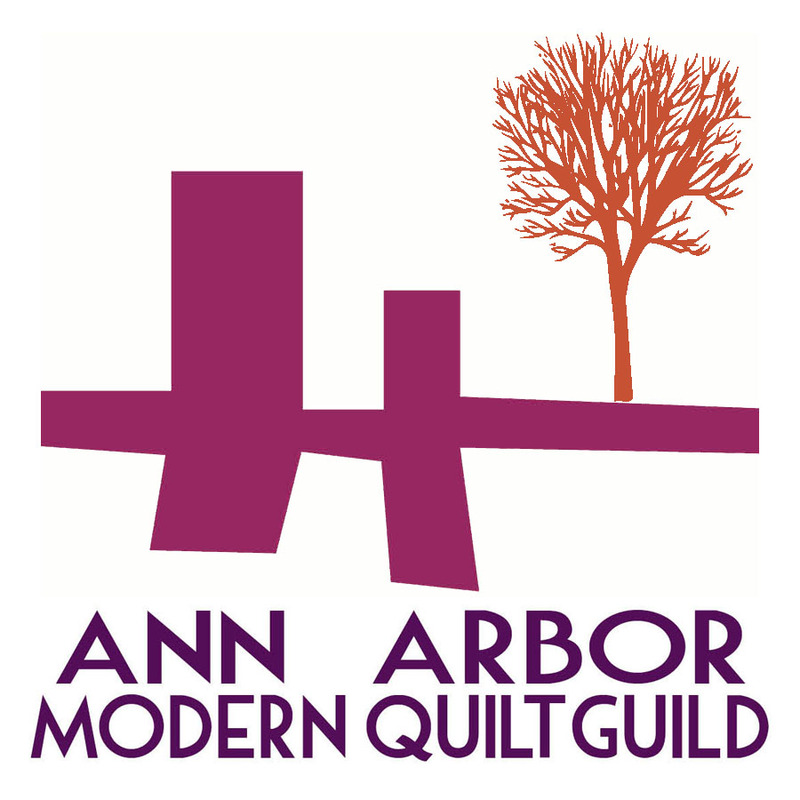 I was so excited to see that the Gee's Bend Quilts exhibit was coming to Michigan last fall and added the date to my calendar right away. 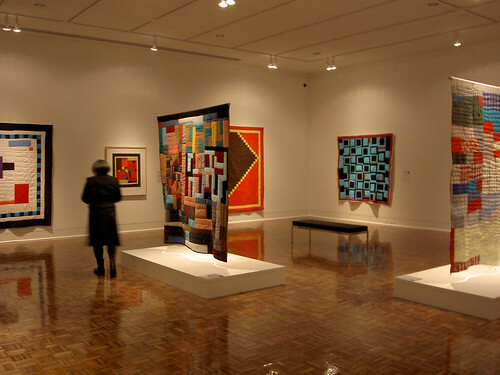 It wasn't until I was browsing the Flint Institute of Art's website two weeks ago that I saw that they were offering improvisational workshops with the artists. I called the museum right away and was got the last spot in the Sunday workshop (talk about perfect timing!). The workshop was totally laid back and our only assignment was to select some fabric donated by the Goodwill and get to work. The ladies from Gee's Bend walked around from table to table and gave us encouraging praise and practical tips for handsewing and we got to soak up their talent and listen to their personal histories with quilting. The greatest piece of advice that I took away from the afternoon was to stop self-editing and judging my work and to just go with the flow. It was such a valuable lesson! 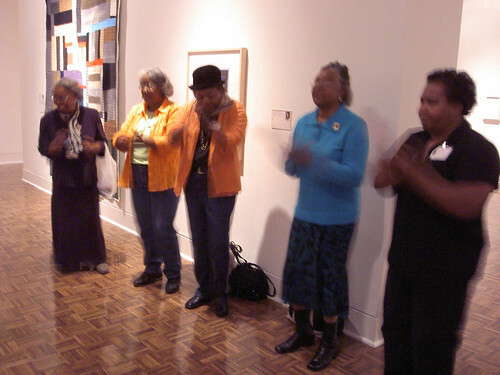 The ladies ended the afternoon by singing together and leading us in a group prayer. It was such a powerful moment. I'm so glad that I was able to meet these women in person! Here's my flickr set with the rest of the photos from the day. 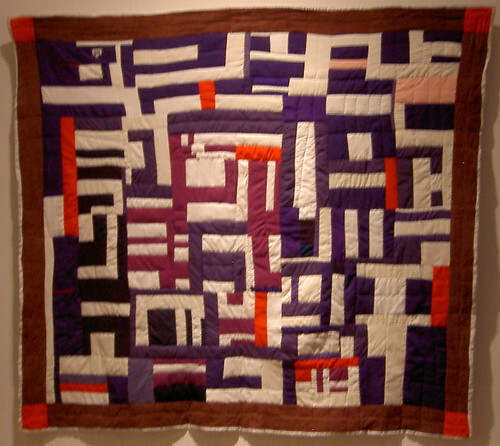 And here's a link to another improvisational quilting exhibit I saw a few years ago. It's shaping up to be a busy final semester for me in library school as I'm spending this semester doing an internship in one of my favorite libraries. Two years ago around this time, I was putting the finishing touches on my grad school application and now my graduation is just around the corner! I've been going through knitting withdrawal these last two weeks! I've been trying to use the cookbooks in my collection rather than just acquire new books (just like in the putting your idea books to use challenge), so in the last two months my sister and I have been baking cookies from the new vegan cookbook, Vegan Cookies Invade Your Cookie Jar. So far we've made Chocolate Fudgy Oatmeal Cookies, Mexican Chocolate Snickerdoodles, Spiced Sweet Potato Blondies, Lazy Samoas, Chocolate Chip Chai Spice Shortbread, Caramel Pecan Bars, and Peanut Butter Oatmeal Cookies. The Lazy Samoas recipe alone makes thie cookbook worth purchasing! Samoas are my favorite Girl Scout cookies and these cookies were so much better than the packaged version. The crowd favorite so far has been the Mexican Chocolate Snickerdoodles, so here's my adjusted recipe for those. Mix together oil, sugar, syrup, and milk in a medium-sized mixing bowl. Add in the vanilla extract. Mix dry ingredients together in a bowl and sift into wet ingredients. Mix the dough together until it is pliable. 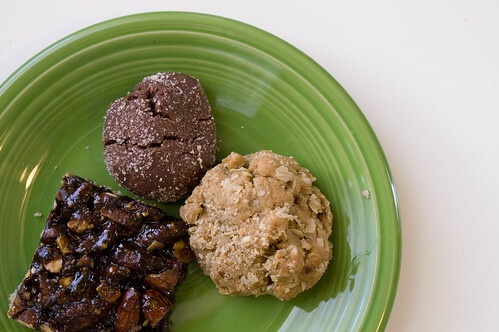 In a separate bowl or shallow plate, mix together the cookie topping ingredients. Roll the dough into walnut-size balls and roll around in the sugar mixture. Place the cookie onto the baking sheet and lightly press the top to flatten. Place cookies 2" apart from each other and bake for 10-12 minutes until they are crackly on top. Remove from oven and let the cookies cool for 5 minutes before transferring to a wire rack to cool completely. My friend, Linda, had her second son just before Christmas and I made this quilt for her new baby. 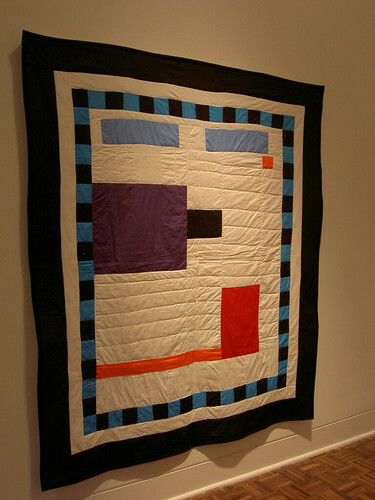 I searched through my flickr favorites tagged with "baby quilt" and based my quilt on this quilt that I found for inspiration. Here's the finished quilt. 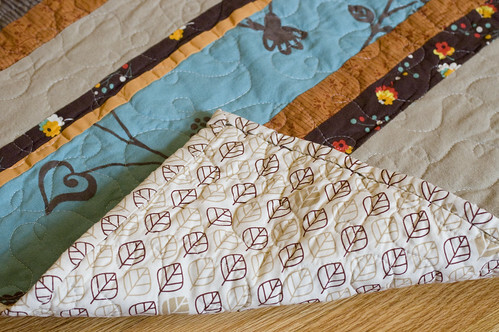 In keeping with my 2010 resolution, everything used in this quilt was in my stash...a little bit of flea market fancy, a little bit of Lush, a few solids and a little bit of fabric bought in Japan. I think this is probably my most favorite color combination and I've got the sudden urge to decorate a room in our house in these colors. But since I'm still recovering from the basement remodel, I think I'll stick to playing with fabric instead! 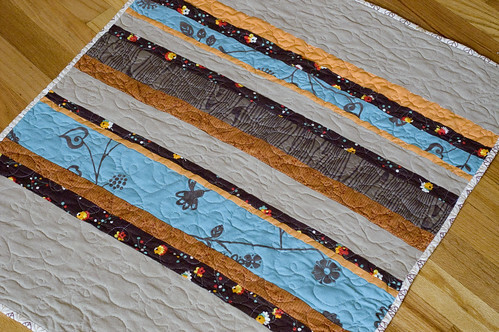 The quilt is 28" x 38" and has cotton batting and some (new to me) loop-d-loop quilting. I mentioned an idea that I had for an idea book challenge last fall and lots of you seemed very responsive. My craft room is filled with lots of beautiful idea books that I never use. Instead of collecting idea books that collect dust on my shelf, I would to make projects from the books I own. I'd much rather have useful projects for around my house than a stack of books that gets neglected. I started a flickr group for you to share your projects from unused and neglected idea books (which, unfortunately, qualifies as most of my idea book stash). If you complete a project based on something from one of your idea books, join the group and upload a picture of your completed project to the group. 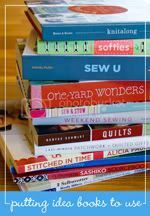 This includes any type of craft - knitting, sewing, quilting, crochet, papercrafting, etc. On February 15, I will have a post here on the blog where you can link up any projects that you have made since the challenge started (if you don't have a blog, then link to your flickr photo of the project). I will select one recipient at random to win a prize handcrafted by me. Thanks for joining along with me as I tackle my book stash! 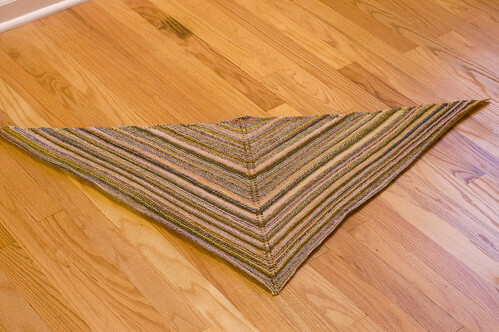 Here's my first finished object of 2010! 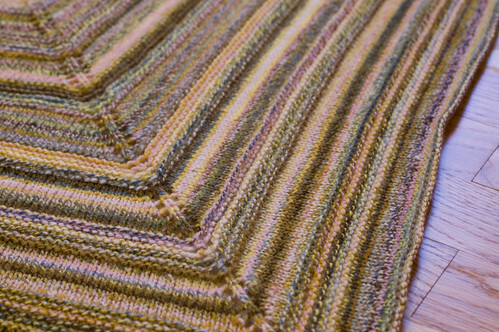 I had so much fun working with Angela's handspun and this was such a simple and gratifying project to make. 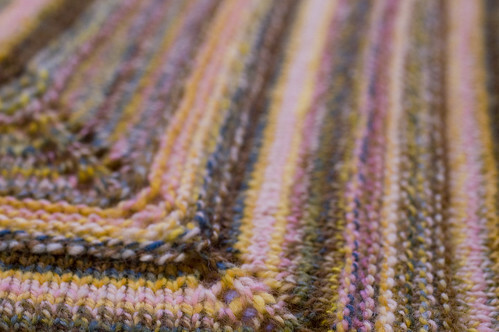 The pattern was simple, so I was able to admire the yarn and color changes throughout the project. 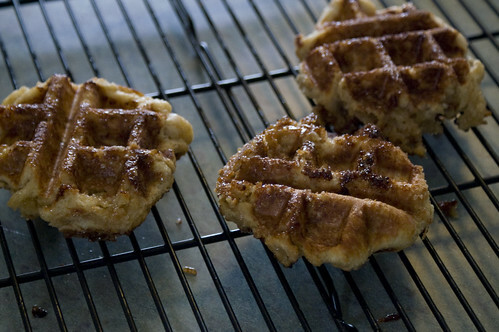 After getting totally addicted to Belgian waffles while in Brussels (see here, here and here), I was totally geeked to find a recipe and tutorial for Gaufres de Liege at notmartha. Jodi came over on Sunday afternoon to test the recipe and we received raving reviews from my sister and our friends Drew and Kathy. The one tip that I can add to the recipe is to pull the waffles out of the iron sooner rather than later to get that soft dough-y inside. 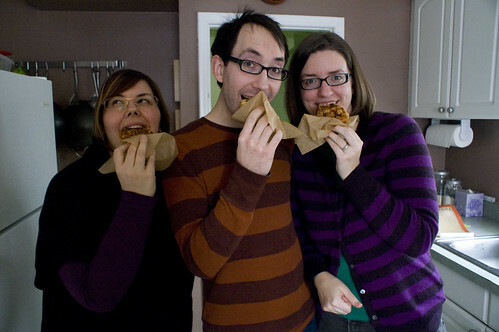 The waffles were totally delicious and just like the gaufres de liege in Brussels! We're finished with our end of the year basement redo project. Here's a whole slew of before and after photos of the project. We are so happy with how things turned out and have been spending lots of time in the basement relaxing in the spruced up space. We have been wanting to update the basement for a while now and finally took the plunge and finished it all within the span of one week. Our main expenses for the update were fabric for wall panels, paint (10 gallons for the whole basement!) and high tech light switches and bulbs (to reduce buzzing noises). 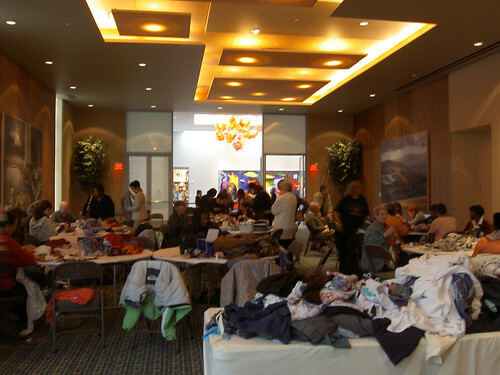 We had everything else on hand or was donated from friends and family. Here's the laundry room side of the basement. The biggest eye sore of the basement was this nasty wall cupboard. I have no idea what it is supposed to be used for, but we store paint and painting supplies, toilet paper and paper towel and our Christmas tree in it. We painted everything on this side of the basement white (including the massively heavy utility sink). many times and we knocked the window surrounds off. Jon updated our electrical...now instead of turning on a surge protector to turn on our paper lanterns, we can use this high tech dimmer switch to adjust lighting. And, the switch is now installed on the stairway down to the basement, so we don't trip around in the dark while trying to find the switch. Jon also added another circuit breaker and four outlet electrical outlet to the tv area. The nastiest part of the whole project was painting the basement ceiling. We covered everything in plastic. Jon used Kilz to prime the ceiling with a spray gun painter. lights instead of plug in paper lanterns. Now we have a real light switch instead of a serge protector attached to the ceiling. We finished off the tv area by painting all of the walls a light tan color. The birch tree artwork is a shower curtain from Urban Outfitters stretched over canvas stretcher bars and stapled to the back. to block off separate rooms. bookshelf the same color as the wall to help it blend into things. We cleared out some of our stuff and covered the rest with black fabric panels. Now the litter box and our junk is behind the curtain and out of sight. Now we don't have to look at our stuff while we're watching tv anymore. You can see the fabric panels behind the tv, to the right of the sitting area, lining the stairs and covering the storage area (in the background). So, here's our "finished" basement. I think we will be refraining from house projects for at least another year after finishing all of this. I definitely don't want to paint anymore for quite a while.